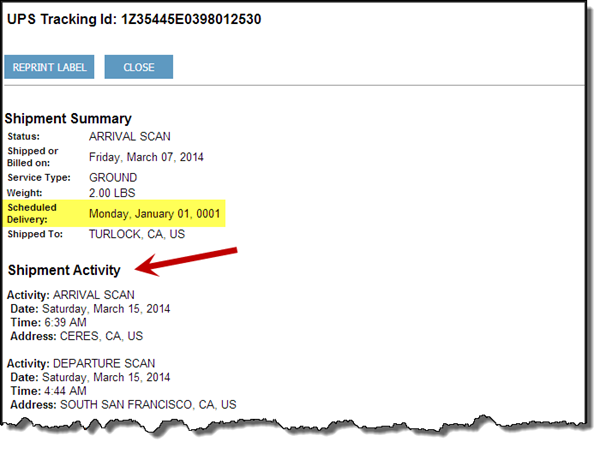 I've seen the UPS Scheduled Delivery date as Monday, January 01, 0001 a few times and was wondering why? I looked at the data and for some reason UPS in certain cases sends us a delivery date of Monday, January 01, 0001. I haven't been able to pinpoint exactly when this happens but we are displaying exactly what UPS is sending us. We will work with UPS to see if we can get to the bottom of it . Until then, please look at the UPS Shipment Activity, this appears to be correct. Thank you and please let us know if you need anything else.